Turkey’s historic city Istanbul is known for many things, like being the world’s only city to straddle two continents, and being a great place to buy a Turkish carpet. However, this ancient city has lived many lives and has lots of stories to tell. There are probably several you haven’t heard yet. Here are 17 things you might not know about Istanbul. 1. Despite being the capital of the Roman Empire three times, and being by far the largest city in Turkey, Istanbul is not the capital. Ankara is the nation’s capital city, since Ataturk declared Turkey a republic in 1923. 2. Constantinople (also previously known as Byzantium, Stamboul and Tsarigrad) was renamed Istanbul in 1930, but locals resisted the name change so, to ensure the city’s new name was used, the Post Office stopped delivering mail to addresses in ‘Constantinople’. 3. Istanbul has a population of over 14 million people, which is larger than the entire population of Belgium or Switzerland. 4. Constantinople’s construction was designed following that of Rome and the city is built across seven hills, earning Istanbul the nickname ‘the city of seven hills’. 5. Istanbul has the third oldest subway system in the world. The ‘Tunel’ line connecting hilltop Beyoglu to Karakoy at sea level, was constructed in 1875, just behind the systems in London (1863) and New York (1868). 6. An underground train system now runs under the Bosphorus too, connecting the continents of Europe and Asia. 7. Istanbul had public toilets long before other European cities. They featured as part of Ottoman-built mosque complexes (which also included public kitchens and schools) and there were over 1,400 public conveniences in Istanbul in the sixteenth century. 8. 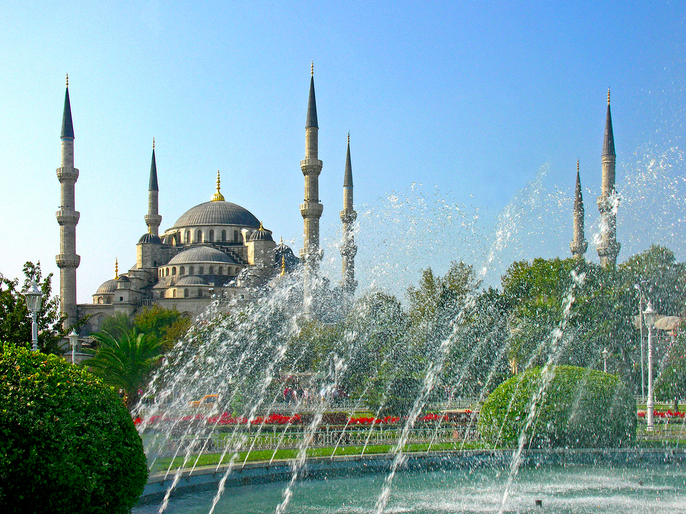 Strange as it may sound, the Blue Mosque in Sultanahmet is the reason the Grand Mosque in Mecca has so many minarets. 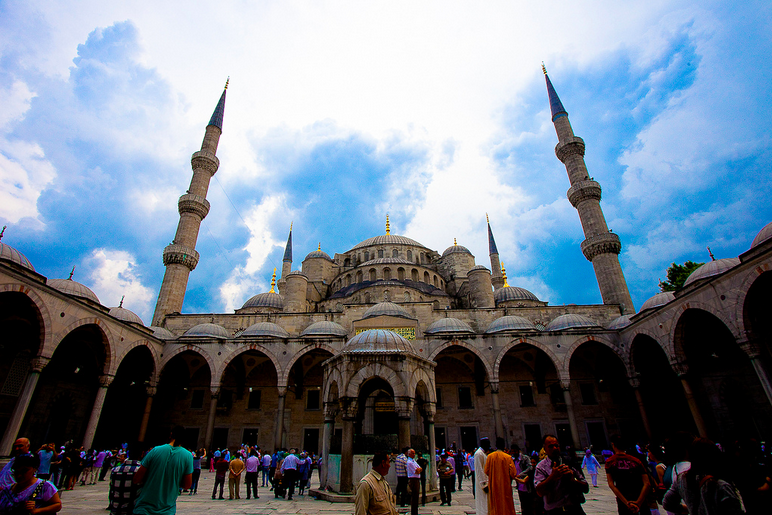 Until the late 1990s (when the Sabanci Central Mosque in Adana was built), the Blue Mosque was the only mosque in Turkey to have six minarets. At the time of construction that was one minaret more than the Grand Mosque, which is considered disrespectful, so an extra minaret was added to Mecca’s mosque. 9. Another of Istanbul’s great monuments, Hagia Sophia, was originally a Greek Orthodox Basilica. It was also the largest church in the world until the sixteenth century when Seville Cathedral was completed. 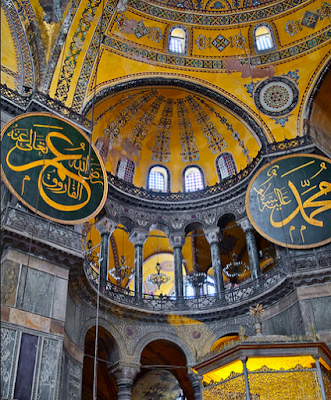 The dome of Hagia Sophia is over 63 metres in diameter and stands 56 metres above ground level. 10. As popular with James Bond fans these days as shoppers, Istanbul’s Grand Bazaar is the oldest and largest market in the world. It was constructed in the fifteenth century and features over 3,000 shops. To read more about the Grand Bazaar click here. 11. British Author Agatha Christie wrote Murder on the Orient Express while staying in the Pera Palas Hotel in Taksim in 1934. The room she stayed in has been preserved. 12. In the early 1500s Leonardo da Vinci submitted plans to the Ottoman rulers, hoping to build a bridge across the Bosphorus. Had it been built, it would have been 240 metres long, but it was never constructed. 13. Speaking of bridges, when the Bosphorus Bridge was completed in the 1970s, it was the fourth longest suspension bridge in the world, spanning 1,074 metres. 14. A few of Istanbul’s trendier areas such as Nisantasi, Levent and Kadikoy offer a selection of international cuisine. Generally however, while Istanbul is somewhere you will eat well, there is not a lot of international food on offer, because Turks favour Turkish cuisine. It’s the perfect excuse to discover Turkish cuisine, such as gozleme, which are savoury pancakes with a variety of fillings that make a great lunchtime snack. Or, perhaps tavuk gogsu for dessert, which, mindbogglingly, is made from chicken, sugar and milk. It’s a bit like a sweet chicken jelly. 15. Istanbul is a city of street cats, probably because the population of Istanbul is largely Muslim. According to legend, the Prophet Mohammed encountered a poisonous snake, but a brave cat rescued him from the danger. Street cats are neutered and released in a bid to reduce their numbers, but locals do not want them to be killed. 16. Istanbul introduced the world to tulips, which originate in Turkey and feature on female Ottoman headstones. Tulips made their way to Europe in the sixteenth century. They were popular as they did not succumb to the cold weather, and have since become synonymous with the Netherlands. 17. Istanbul is one of the world’s few cities with beaches. They’re not right in the city centre, but on the Sea of Marmara and Black Sea coastlines, so there are plenty of options to escape the heat of summer, including True Blue Beach, Golden Beach, Solar Beach, Burc Beach and Dalia Beach.